I dont have to be a sports fan to comment on the stadium proposal for the 2011 Rugby World Cup. I simply have to be a ratepayer. We need to focus on what kind of existing infastructure we have, and look at the projects currently underway of improving/increasing its capability, then think carefully about the future, instead of rushing to the easy answer. Easy Answer: Build it on the waterfront. It will "look pretty" [see the corporate video], there are no noise restrictions, it will benefit the central city's hotels and overall economy for certain, and its close to britomart and the viaduct as well! It's asthetically and economically pleasing! I just don't like the fact that 60,000 more cars will enter the city for the events held there. 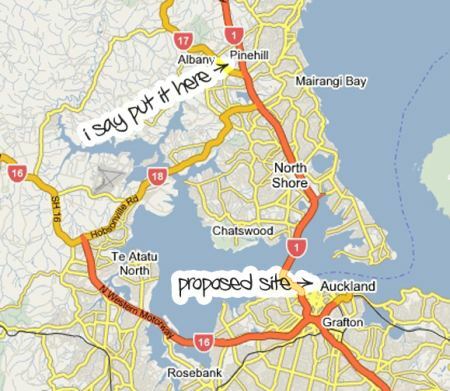 What about something simple like.. how human waste will be pumped into the Auckland Harbour. Come on! They wont pump it anywhere else as the CBD's waste system is appalling!. 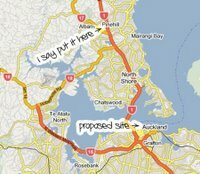 Auckland City's traffic problems are already a hot potato. By doing this, you simply cripple it further. Auckland does not have any other supporting public transport infastructure to accomodate this like, oh, a monorail? Better Answer: Take it north. Sure, the North Harbour Stadium is at the fringe of the North Shore, but it's at the end of a vital public transport line that is underway to fix forecasted traffic congestion - and to boot, it will be completed next year!. Traffic is instantly no longer an issue. North Harbour Stadium has ample access, parking and plenty of space for development. It's still growing up there. BUT Auckland City needs to benefit!!! And it will. I say spread the visitors and tourists out across the city. Re-develop the Auckland City waterfront like Sydney, with grass, public spaces and parks! Look at the popularity of Mission Bay. Why not connect this walk to the city, with greenery? We need to create a feeling of 'space' in our city. Room to move. People will then use the accomodation in the city, use its nightlife, its public transport and most importantly explore the greater city - especially when it comes to SPORTING EVENTS - instead of stupidly keeping them inside the CBD. Dare I mention what kind of economical nightmare the last power cut had on the city?. With the extra money saved, you could build underground tunnels for further motorway/traffic development. As for Eden Park? Keep it "grass-roots" and for NPC Rugby, and Cricket. Eden Park is full of local history and that means everything. We must preserve local history, and develop Auckland City with great consideration, coz you only get one chance. To hammer my point, I will say this. The Skytower is not an icon I identify with Auckland. I never will. One Tree Hill (when it gets trees again), and the Auckland Harbour Bridge are icons. The Auckland Domain is an icon. The Skytower is repulsive, and so would an inner city stadium like that proposed. SPEAK UP AUCKLAND. Speak with your heart, coz you live here.